Over a decade ago, my dad moved down to Florida, to the small town of Spring Hill, which lies just north of Tampa. During that time he has been blasted by a number of hurricanes, most notably last summer when four different storms roared over Florida within a one month period. However, his town has not yet felt the brunt of any direct hits. They have been skirted past and brushed by, feeling some effects of wind and rain, taking some minor roof damage, but escaping any large-scale or lasting effects. Now here comes what likely will be the final tropical storm of what has been one of the most memorable in history, what with the destruction wrought on the Gulf region by Hurricane Katrina and Hurricane Rita respectively. 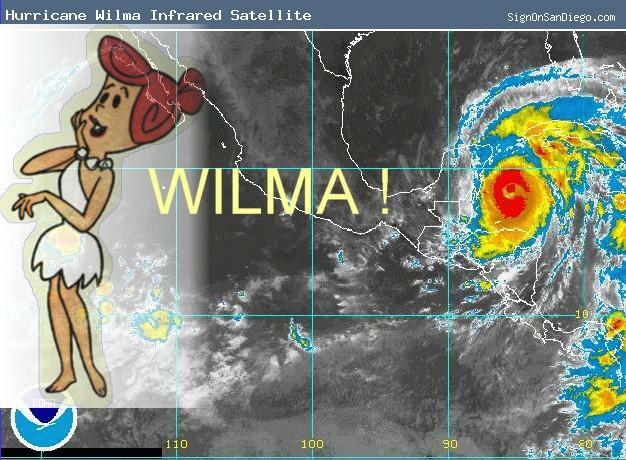 Hurricane Wilma (I can't help it, I keep picturing old Hanna-Barbera cartoon character Fred Flintstone's red-headed wife, and Fred yelling "Wilma!") suddenly formed in the Caribbean, exploded quickly into the strongest Category 5 in recorded history, and is poised to slash across Florida over the coming weekend. As of right now, the entire state is in the potential path, though that will narrow over the coming 48 hours. I will be saying yet another prayer for those folks, especially my dad and his wife, but someone is gonna get hit by this thing. Oh, and just as a parting gift to the season from the tropical storm gods, the storm may ride up the east coast and come visit me next week. As Fred would say..."Wilma!" I used to live in Spring Hill, Fl (West Hernando county) a suburb of Tampa and they have also never been hit by a hurricane (as far back as I can remember which is the late 70's) I hope the area will continue to be lucky. I've been praying for everyone in the path of these hurricanes. Your father and his spouse will definitely be in my prayers. That is exactly the area that they are in. Here's to hoping the good luck continues this weekend. Gas Prices Up: Sky is Falling ! "The Brothers & Sisters Are Running This City"